Summer is a time to spend with family, going on vacations, and hanging out on beaches or near the pool. Summer is also a time where things get a little off track. Life happens in the summer, you want to take advantage of as many opportunities as possible. From trying to sync up with old friends who are in town to scheduling family vacations, the summer is when your life really gets off track. While the holiday season can be just as rocky, summer is the opportune time to really expect the unexpected. For example, you could be expecting a low key weekend where all you did is exercise, but then a music festival comes up or an art show that seems to take all of your time. There’s nothing wrong with spending the summer getting out of your routine; however, the more time you spend doing out of the norm activities the harder it can be to get back to your old life. If your old life involves exercising six times a week and you’ve suddenly missed a week’s worth of exercises, then two weeks, then three, and finally you can’t remember the last time you exercised; you may find yourself taking a hiatus away from fitness classes and other exercises you find enjoyable because of a busy schedule. 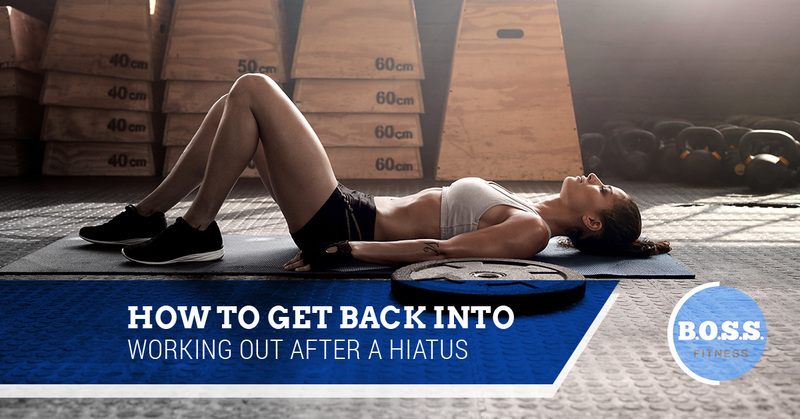 If you’ve fallen into a rut of avoiding the gym, then it’s time to break the hiatus and work yourself back into the healthy habit of exercising. If you’ve spent the summer traveling – good for you, we’re jealous – or just participating in an array of summer activities, then you’ve probably dropped the ball on exercising. We don’t blame you, a lot of people get busy during the warmer months, which is why we want to give you some helpful tips for getting back into working out after a long time away. The longer you wait to get back into exercising the lower your motivation will be to get back into it. If you’re looking for a healthy dose of inspiration to get back to exercising, then we can help you with these tips. Don’t stop exercising just because you haven’t been in a few weeks! It’s never too late to get in shape. The best way to get back into the gym is by picking out a class you really want to go to or go back to the fitness class that you stopped going to. If you truly loved that kickboxing class, then what’s stopping you from going back? If you enjoyed the people in your Body Pump class, then sign up for it again! When you pick a fitness class that you want to go to and you’ve been to previously and enjoyed, you’ll have a higher chance of actually going to it. If you haven’t exercised in months and you want a new exercise routine to keep you motivated, then pick out a few classes at times that will work for you and get started. Fitness classes are great for those who don’t have that much motivation to exercise. When you sign up for a fitness class you’ll be expected to go, you’ll have paid the money, and you might even sign up with a few friends who will keep you on the ball of showing up every week. Exercising produces endorphins in your brain that make you feel good. If you start exercising consistently, you’ll find that you feel amazing after each fitness class, personal training session, or just some cardio you decided to do after sitting at a desk all day. If you need that special dose of motivation to really get you going, then take a moment to remember how good you feel when you move your body. When you focus on the effort you give exercising and know the outcome, then you’ll remember how fantastic you feel afterward. That feeling will give you the motivation you need to go to the gym to work your body. Remember you’ll never regret exercising, you’ll just have sore muscles. Another great way to get motivated to head to the gym after a long time away is by making an appointment with a personal trainer. A personal trainer will help you get back on track both physically and mentally. When you meet with a personal trainer at B.O.S.S. Fitness, you’ll be able to ask them any questions you may have, experiment with new exercises, and start small so you can work up to your full potential. Don’t let a hiatus scare you from visiting B.O.S.S. Fitness. Sign up for a fitness class or with a personal trainer to get back toward your health goals. We look forward to helping you get back on track!